This started as my official end of year hive update, so now it has become my official beginning of the year hive update. Happy 2016 to one and all. The hives are officially closed up until spring is on the horizon. With our mostly warm days of late, this might come sooner than expected. 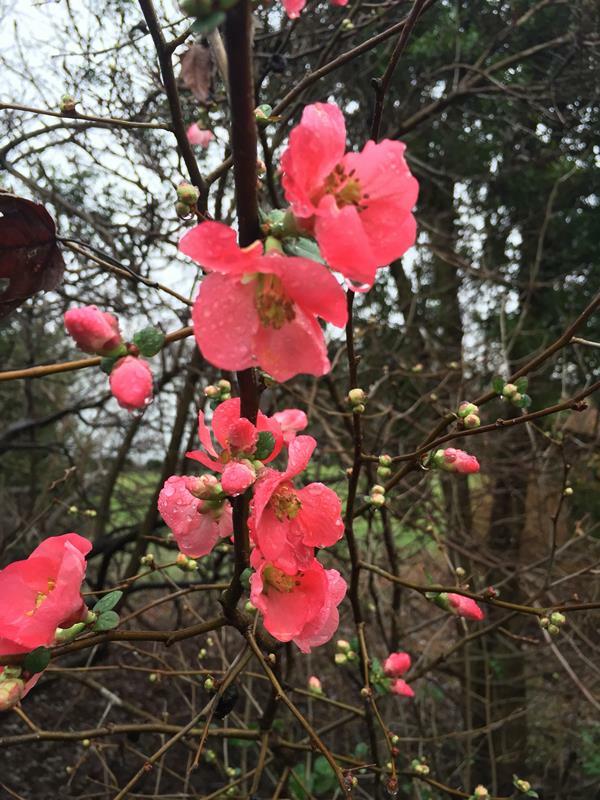 We had some bushes start to bloom, especially our two Quince bushes, though the weather turned decidedly cold this week so winter seems to have finally arrived. I really did find over 1001 mites in our two Langstroth hives. I first noticed 20+ mites on the bottom boards around American Thanksgiving in November, and then monitored them for the next month or so. Mars was dropping around 8-9 mites a day, while Jupiter was dropping 10-11 a day. All told, I counted well over 500 mites before Christmas, when I felt compelled to do something about it. With temperatures in the 60’s and 70’s, I realized a mite-away quick strip (MAQS) might do wonders, so I slapped one on each hive. That’s the short summary of my last post, a rather inspired Christmas poem, if I may so so. With the weather about to turn colder, I pull the strips after 5 days even though the recommended dose is 7 days worth. 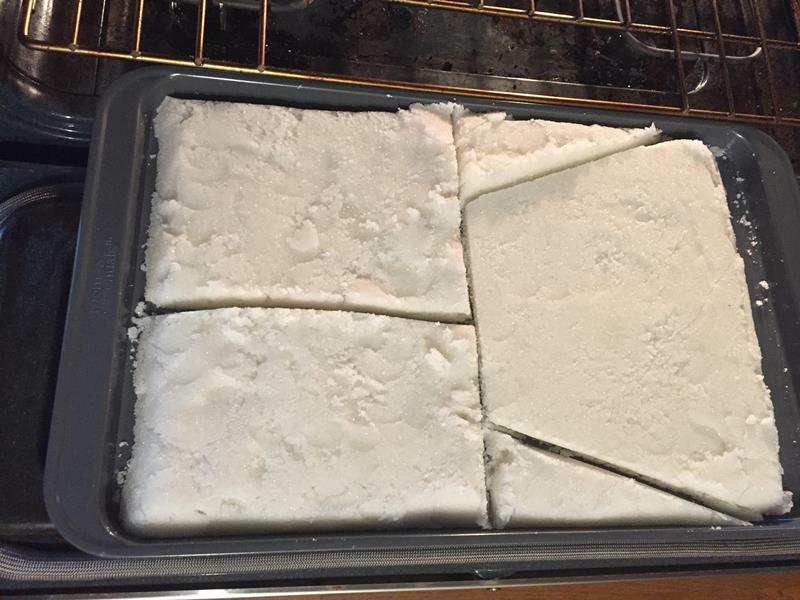 I also wanted to try my hand at a sugar brick, so I made a single cookie-sheet worth and cut them up for the hives as shown in the picture. These I applied to each hive as I strapped them down for winter (again). 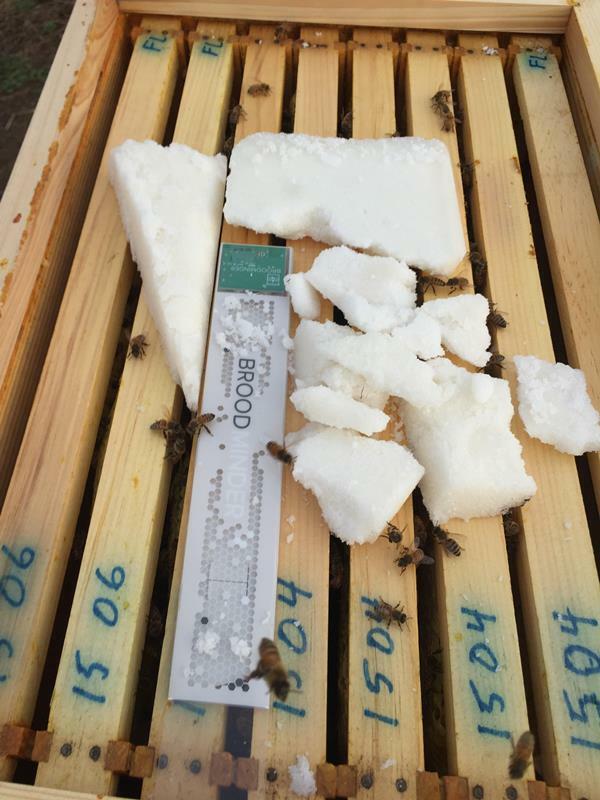 Here is a summary of each hives’ status, followed by my goals for 2016. This hive consists of a deep and two medium 8-frame boxes. I’m not exactly sure where the bees are clustering, and not wanting to break apart the boxes in the middle of what is supposed to be winter, I placed the mite-away strip at the top. If the bees moved down below the top box, perhaps it affected the strength of the treatment. When I removed the strip on December 27, I counted a meager 135 mites on the bottom board, a drop of around 27 per day. 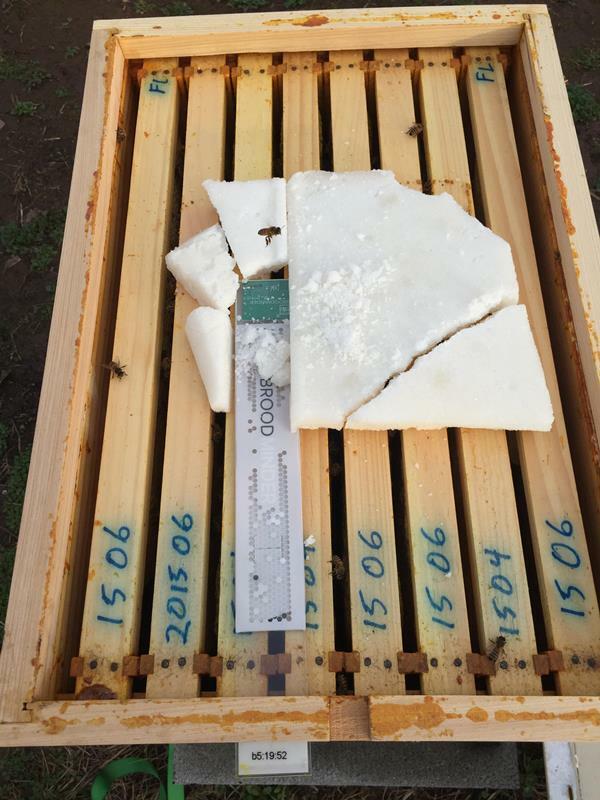 Unfortunately I dropped the sugar block for this hive on the ground and it broke into a dozen pieces. The picture shows what I was able to reassemble on top of the hive before I closed it up. There were plenty of honey stores remaining, so hopefully this hive is good for the remainder of winter. Two days later on December 29 there were 10 mites on the bottom board, or 5 per day. Another 5 days later (January 3) I counted 25 mites, still 5 per day. So the mites are lurking but a bit more under control. Cross your fingers. Our middle hive is also our shortest: one deep and two medium 8-frame boxes. Even though a smaller hive, it was dropping the most mites (11 per day) so I was a little worried about these girls. As a smaller overall box, the treatment was perhaps a bit more effective. When I removed the strip I painstakingly counted 420 mites on the bottom sheet, a drop of 84 per day (wow!). The honey stores looked good, and I managed to place a somewhat whole sugar block on top. My two-day check on December 29 yielded sixteen mites for this hive, a drop of 8 per day. My check on January 3 yielded 27 mites, a mere 5-6 per day. Never having done this, I am not sure what to expect, and this is a little higher than I was hoping. Removing hundreds of mites must be a good thing, right? We’ll see how I feel in a few months. As you can see in the pictures, I also added my Broodminder sensors back on both Mars and Jupiter. The folks at broodminder.com confirmed that there is indeed a problem with the humidity sensors, as I found as well. The latest is that the manufacturer (Texas Instruments) has issued a recall on the sensor chip, so we’ll have to see how this plays out. This morning was around 10 F outside (around -12 C) and both sensors reported a top of the hive reading around 42 F (5 C). I did find it nice to have a temperature reading from the hives, and I knew to ignore the errant humidity readings of 100% RH. My sugar holder for our top bar hive. Our top bar hive was rather active during the warm weather. This started as a package of Italian bees, as opposed to both Langs which started from nucs of Russian bees. I was a bit worried about the stores in this hive, as I know Italians do not shut down and huddle for winter as frugally as the Russian bees. The Italians had maybe 35 to 40 pounds of honey stored up going into winter, a bit less than the local recommendation of 50-60 pounds. So if any hive could use some extra feeding, I figured this was it. A filled sugar frame on top of the hive. It’s only a little broken…. I made a sugar holder for this hive by attaching 1/4 inch mesh to a top bar and cutting it to form a frame. 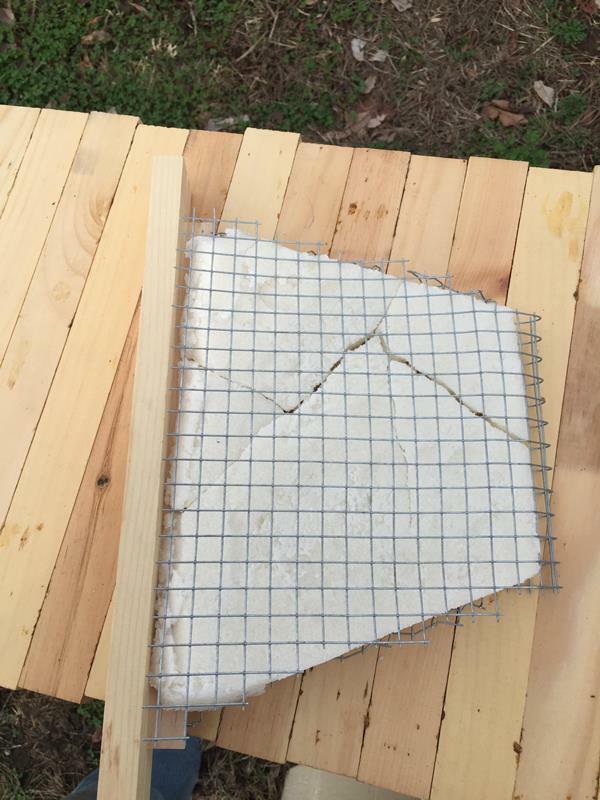 The hard part was getting it to lay flat, and since I do not have a staple gun I had to use small nails to hold it in place. I inserted my slightly-broken sugar block into the frame, and was able to place this just past the last comb of honey. Once again I enjoyed the fact that a top bar hive allows me to remove only a few bars and not disturb the bulk of the bees. I saw three frames full of honey still in the hive, so perhaps Venus we’ll do just fine. I didn’t want to disturb the brood nest, so I put them to bed. For 2016 I’m not quite ready to go all-in on either Langstroth or Top Bar Hives. I enjoy both hives types and I’m interested in learning more about the pros and cons of each in the coming year. My goals for 2016, in priority order, are as follows (comments or suggestions are always appreciated, of course). My other goals may make this more difficult, so will have to keep an eye on this objective. If the hives hit the spring in good shape a reasonable honey crop seems very possible. While I enjoyed Venus immensely in 2015, I’m not completely happy with the design of the hive (which, if you’ve been following along, I purchased). The combs might be a bit small and the interior width varies where the observation window is placed. I am working on a new design that I’m planning to build with my dear father, who is quite the woodworker up in Ithaca, New York. I’ll post about this in the coming weeks. 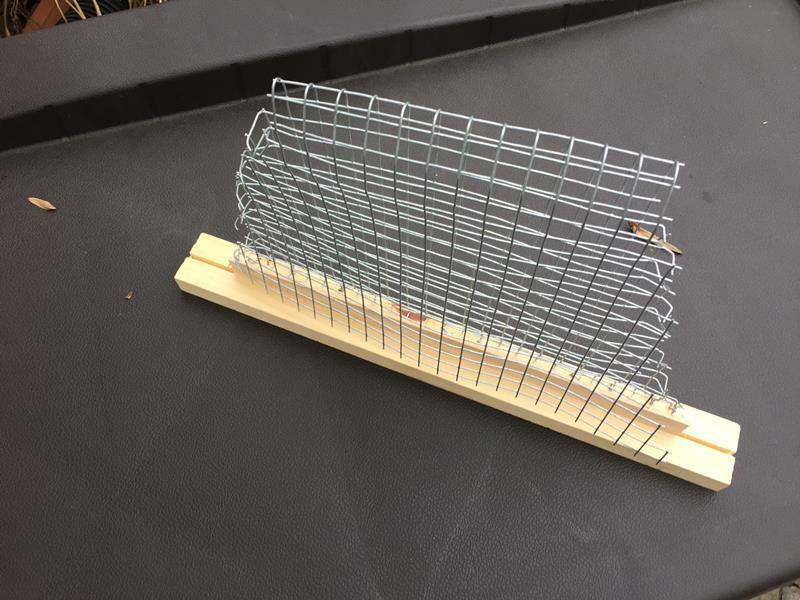 Still working on how exactly to transfer some of my existing top bar hive combs over to a new hive with longer top bars. I have a couple ideas, so stay tuned. Learning how to divide one hive into two or more seems like a good skill to have, and I’m interested in allowing the bees to raise their own queen. The best scenario would be if I can catch a hive building swarm cells and do an artificial swarm. Swarms are said to produce the best queens, and swarm bees the best comb builders. I’ll consider myself lucky if this happens, and otherwise hope to split one of the Langs or even the top bar hive depending on how they are doing. Of course, dividing a hive’s resources affects the amount of honey the colony collects, so this is where the priority of my first goal might be an issue. I plan to see how the hives are going into spring and decide if this is still possible. The bees were not at all interested in my meager “pond” last year. Since the fish seem to be surviving the winter, I’d like to give them a bigger space with better drinking spots for the bees. Hoping to work this out before spring arrives, after #2 above. My Langstroth hives have a deep box (about 9 inches) on the bottom with mediums (about 6 inches) on top. A number of beekeepers recommend all mediums due to the ease of moving frames around and the lighter overall weight. I can see this after my first year, so depending on how the hives are doing I may try to make this happen. Going into winter both Mars and Jupiter had very little stores and brood in the bottom deep box, so this may be an easy switch. The one drawback would be the loss of comb, which is why this is my lowest priority. There has been a lively discussion of this on beesource recently, if you are interested. Varroa mites are Asian, of course, not Arabian, but I couldn’t resist the play on words from the story of the 1001 Arabian Nights, or simply The Thousand and One Nights. There are a number of versions of these stories available, with the common thread of a Persian King Shahryar and his wife Scheherazade. The wife tells the king a new story each night, or extends or finishes a story every night, to entice the king to keep Scheherazade alive for one more day. In the end the king falls in love with his wife and abandons his plan to kill her. The stories include well-known tales such as Alladin’s Wondeful Lamp, Ali Baba and the Forty Thieves, and The Seven Voyages of Sinbad the Sailor. Dang! That’s a lot of mite counting! Would have loved to hear the conversations between you and your colleagues on Jan. 4. “So how was your vacation? Do anything special?” “Counted mites.” LOL — that’s an activity only another week would understand. Glad to hear the the mite drop is more reasonable in the Langs now. Fingers crossed for them. Regarding going to all mediums — Are you using plastic? If you have foundationless frames, couldn’t you just cut out the comb to size and rubberband them into smaller frames? I suppose even comb with wired foundation could be cut. It would be a little harder, but doable. Looking forward to seeing the new TBHs and updated fish pond! “only another beek would understand” — Autocorrect. Phooey. Thanks Julie. Hadn’t thought of cutting down the deep frames. Have to mull on that. Most of the frames are wax foundation so it would likely work. Good to nuke all those dastardly mites. He he, yes we must be very quiet while we sneak up on those dastardly mites. Thanks! I’ll keep that in mind. You never when one of those “mite” sneek up on you.